“I didn’t know the good Lord considered Christian values to be voluntary.” I was engaged in yet another pointless Facebook debate with one of my liberal friends whose minds I am never going to change when this statement was made. It was a light bulb moment. I realized that the root cause of our disagreement was not actually over whether one has a right to a guarantee of some arbitrary minimum versus a right to reach their full potential. Instead, we disagreed over the core concept of free will, something that is essential to both the LDS Church and Libertarians. The eternal arguments for and against free will are alive and well in today’s political dialogue. So two plans for our progression were put forth. Heavenly Father planned to send us to the Earth where we now live, so that we could have bodies and be tried. We would be given commandments to follow and help from Him, but we would have free will to choose for ourselves who and what we would follow. Heavenly Father knew that we would fall short, and so we would need a Savior to take upon Him our sins, such that we might be able to live with Father again. Jesus Christ was chosen to be that Savior. We covenant with Him, which means we promise to do our best to follow His commandments. In His undying and infinite love for us, He Atones for our sins such that we might receive eternal life with our Father. This plan is known as the Plan of Salvation or Plan of Happiness. The second plan came from one of Father’s brightest angels, a morning star, whose name was Lucifer. He didn’t think Father’s plan would work. He proposed instead of free will that everyone would be forced to obey, and in that way, every single person would be “saved.” Not a single soul would be lost, Lucifer promised, which was contrary to the Father’s plan, in which free will meant that some would not choose to follow the Lord. Because Lucifer considered himself a more effective Savior, saving all people, he demanded the Father’s glory. What happened next is proof that free will is not just essential to our faith and the Father’s plan, but also is eternal. Lucifer lost, and a great war in heaven occurred, in which one third of the spirits in heaven chose to follow Lucifer instead of the Father. They were thrown down, and became Satan and his devils, respectively. Those 1/3 were not compelled to follow the Father. They were permitted to make their own choice. Free agency, which is so critical to the Lord’s Plan of Salvation, is also an eternal characteristic. It is something that we all have had, from the beginning of time. Every single person who is a human being with a body on this Earth today, Mormons believe, at one point made the decision to follow Heavenly Father’s plan instead of Lucifer’s plan. Every one of us chose free agency over compulsion. We took the red pill. 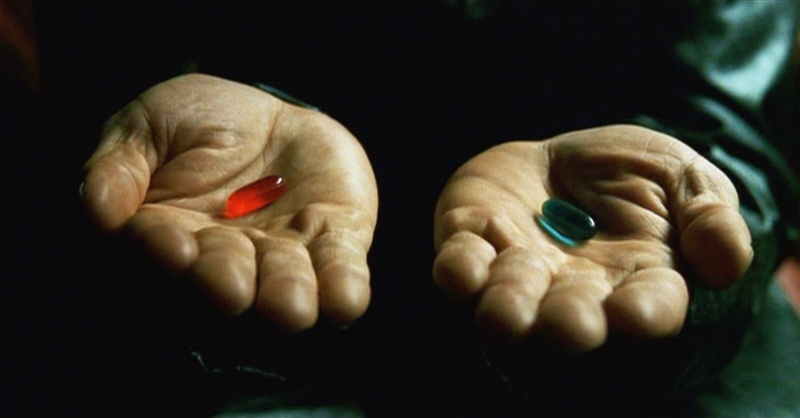 It is my opinion, though, that there is something equally eternal about our vulnerability toward Satan’s counterfeit of “justice” (the blue pill). What follows is not Church doctrine, but simply my opinion. You can take it for what it’s worth. I believe that, considering that Lucifer was a “morning star”, that in the very, very beginning, he meant well. But, he allowed this false sense of “justice” to lead him into irreconcilable evil. I believe that Lucifer looked at Father’s plan and knew that some of his brothers and sisters, fellow spirit children of Heavenly Father, would not return to Him. I believe he thought this inequality of results was unjust, at least at the very beginning. He saw himself and his plan of “salvation by compulsion” as a better plan, and began to get a haughty view of himself. He believed that since he would guarantee salvation for everyone, he was worthy of the Father’s glory, and for such heresy, he was cast out, along with all who followed him. But how did he get so many to follow him? In my opinion (again, not doctrine), he did it the same way that we see practiced today, in modern society. “Susan,” he might have said to one of his spirit sisters in the Pre-Existence, “this ‘life’ that the Lord is proposing for you will include being molested by your father, and falling into prostitution at the age of 16, while JoAnn will get to live in a middle-class neighborhood and attend college.” Then, to another, “George–your father will be killed in a war when you’re 7, and you’ll live in poverty the rest of your life. You’ll die under a bridge in the rain at age 20. But Peter over there will become a CEO.” Then, to another, “Job–your entire family will be killed, you’ll lose all your wealth, and you’ll be covered in boils and cast out from the presence of your fellow citizens.” He might have said to the Host of Heaven, “How is this fair? How can we expect Susan and George and Job to choose the Lord’s will, and covenant with Him? Why do some have to go through more trials than others? Do you really think they will choose the Lord’s will after going through all of this? Follow me! I will guarantee your salvation! I will ensure that everyone is saved!” Sound familiar? There are parallels between Heavenly Father’s plan and Libertarianism, as well. We both believe in everyone being given the freedom to reach their full potential, rather than being forced by the government to guarantee some arbitrary minimum result. We believe that choices aren’t choices unless they are made freely. We believe that charity is not charity unless it is voluntary. We believe that the government is there to preserve life, liberty, and the pursuit of happiness, and this is all they are there to do. They are there to make sure that no one kills you while you are finding a way to feed, clothe, house, and heal yourself. They are not there to feed, clothe, and heal you. The only time they can justly take away a person’s fundamental rights is when he is taking away someone else’s rights–if I pursue my happiness by killing, the government has an obligation to stop me, to imprison me, perhaps even to kill me. The free market, likewise, is directly aligned with this philosophy. The government is there to keep the market free–to prevent monopolies from forming, so that the market (or the population of people) can choose the products and prices they want. Far from picking winners and losers (whether they are Republicans picking oil companies or Democrats picking solar companies), the government should stay out of the free market entirely. They should not give “welfare” to corporations or to individuals. Only then will the market be genuine, and only then will wealth legitimately belong to those who earned it. Some might claim that this plan will never work, or that it is unfair. It leads to “income inequality.” Others might claim that it is unfair to those who are born with less, and have a larger mountain to climb. And finally, some might claim that it is impossible that everyone would choose to follow the law. They would argue that we must force individuals to behave. I will now bring in prominent author and Mormon, Clayton Christensen, of the Harvard Business School. “Democracy and capitalism both depend on large-scale obedience to the unenforceable.” Unenforceable? Big government advocates would say that this is hogwash. Of course the law is enforceable! Of course you can compel people to behave! But when you really think about it…no, you can’t. I think I was about eight or nine when I first figured out that all of society hinges on someone’s willingness to obey, behave, and Choose the Right (and at that time, I was not yet a Mormon). I was thinking about my punishment for not doing something or other that my parents had asked me to do. I recall thinking, “Well, they’ve punished me because I haven’t done it. But that doesn’t mean that I have to do it in the future. Their punishment doesn’t make me do it in the future. I can choose to just not do it, and they will probably punish me again, but it still won’t get done. I can choose not to do it forever, and eventually they will get sick of punishing me and not punish me anymore, and I will have won. I won’t ever have to do it.” Then I realized that this idea actually extended to all of society. “Why does anyone obey laws?” I wondered. “Why do people not just run around and do whatever they want?” I thought it was probably because of the consequences. But then, I knew it was against the law to go above the speed limit, and saw people regularly doing that. My brother, who was five years older, told me that ‘no one’ went only 25 miles per hour on the road. And as I rode with friends’ parents, I discovered that this was largely true. No one obeyed the law. So I realized that people literally chose what laws they would obey and what laws they would not obey. Much later, in college, I learned from independent study of our nation’s history that this concept was called Natural Law. There is a very basic concept that the Founding Fathers set forth in our documents that essentially amounts to this: government that goes along with human nature will succeed, and government that goes against human nature will fail. It is human nature that we desire the inalienable rights of life, liberty, and the pursuit of happiness. Men are naturally free–we are born that way. In the LDS Church, we believe that our free agency actually is eternal. We always have had it and we always will have it. When people impose laws upon each other that go against free agency, like big government tends to do, people are less free. But God’s Law, you might argue, seems to do just that, doesn’t it? Especially in the LDS Church, where we have some “restrictions” which are abnormal for society. We don’t drink alcohol, for instance. This argument about God’s Law brings us back to that question that prompted this post–my debating opponent did not think that the Lord’s Law was voluntary. In actuality, every law is “voluntary”, including the Lord’s. But there are consequences, sometimes eternal and sometimes temporal, for not obeying. Our laws are like the Biblical law that says you cannot murder or commit adultery, but for a different people. These laws are for we who have decided that we want to partake of a different, I would say more involved, covenant with the Lord. They are not for everyone–that is why those who freely decide not to be baptized need not follow them. Agency, therefore, is still preserved for all. Meanwhile, when observed, the law makes us more free. The concept of a law making a person freer is actually a very common one in libertarian philosophy. A very long time ago before institutionalized government, during the cave man days, let’s say there was a man named Ugga. While Ugga was away hunting, a big man came along with a club and beat Ugga’s wife, and stole his food. When Ugga returned, the cave men convened in a council and decided to prevent this from happening again by having Grunt, another big man, stand guard over their caves with his club. Meanwhile, since Grunt’s new vocation prevented him from hunting, Ugga and his friends would pay him in meat. Grunt was the very first Government. Grunt is there to allow Ugga and company the freedom to go hunt. If not for Grunt, the cave people would not be as free. This is the core purpose of government. Now, another cave man named Chum comes along. He’s a very poor hunter, and incapable of feeding his starving family. So he sneaks into Ugga’s cave and steals from him. Grunt stops him. One might say that Grunt has restricted Chum’s freedom, but this restriction is just. Grunt is preserving freedom–he is ensuring that Ugga can still leave his cave and his possessions are secure. Grunt is only stopping Chum from pursuing happiness because Chum is trying to take away Ugga’s happiness. If Grunt takes pity on Chum and decides to give him some of Ugga’s meat without Ugga’s consent, this is theft. Today, we would call it “welfare.” Those who support government mandated “charity” would say that guaranteeing Chum’s quality of life is more important than Ugga’s freedom and property rights. But libertarians would say that it is up to Ugga to give to Chum or not, and up to Chum to find some way to feed his family. Maybe his cave drawing skills exceed his hunting ability, and the other cave men will pay him if he draws their family history on the walls. Who knows? But it is not Grunt’s job to give Ugga’s meat to Chum. If he does, then he has betrayed his oath of office, and the very purpose of his position, as he has made the cave men less free instead of freer. Mormons believe the very purpose of life is to exercise our free agency. This is why it is an eternal gift, and why the natural state of mankind is freedom. Governments are instituted by men to secure freedom. Laws that restrict free agency undermine the purpose of life and will fail in the end. Because we have freedom, though, inequality is inevitable. “Wherefore, the Lord God gave unto man that he should act for himself.” (2 Nephi 2:16) This is also why charity is paramount to our faith, and essential to the effectiveness of Libertarianism. “For if ye have not charity, ye are nothing.” (Moroni 7:46) From the beginning, some have presented forced equality as a counterfeit of justice, and many have bought into it. In Mormonism and in Libertarianism, and all throughout our Founding Documents, we see the true formula for happiness is rooted in self-direction, willful obedience to laws that make us freer, and respect for each person to choose according to the dictates of his own conscience. I’m so sorry you feel that way. Please let me know if you’d like to learn more about my faith. I’d be happy to answer any questions you might have. I loved your article. I’ve been thinking how being a law obeying citizen actually has made me feel taken advantage of, unsafe, and vulnerable. I’ve also said if the government conducted things more simply, like our LDS church, life would be so more plentiful and prosperous for all. I especially loved your Ugga analogy. Funny but so on point. Thank you. I’m sharing on facebook. Thank you so much for reading! I really appreciate your comment, and that you’ve shared the article. I hope it helps others understand libertarianism!